Why BHP Billiton Shares (ASX BHP) Is A Stock To Buy | MF & Co.
BHP Shares (ASX BHP) is a world-leading resources company by market capitalisation. Diversification by commodity, geography and market strengthens BHP stock ability to cope with market volatility unlike Rio Tinto (ASX RIO) which is less diversified. However, potential liability from litigation resulting from Samarco dam failure in 2015 is subject to significant uncertainty. Unexpected natural catastrophes might affect the assets adversely and continued volatility in resource prices may impact future cash flow. BHP Billiton stock, a triple-listed public company headquartered in Melbourne, Australia, is one of the world’s largest mining company. It engages in extraction, processing, sales and marketing of coal, iron ore, petroleum, copper, uranium, oil and gas. ASX BHP shares market capitalisation is currently around 96 billion AUD whereas Rio Tinto (ASX RIO) is 32 billion and South32 (ASX S32) is at 20 billion. Operating in over 25 countries, BHP generated 26.1bn USD total direct economic distribution and returns 4.4bn USD to shareholders in FY2017. BHP Billiton owns and operates 31 long-life, low-cost, expandable, upstream assets diversified by commodity, geography and market. Standardised systems, strong ability to make continuous use of infrastructure and efforts to introduce technology position the company to further productivity. Alternatively, the geological problem in both Broadmeadow and Blackwater coal mine is not likely to be solved until the end of first quarter. Following sliding oil price and U.S. Oil and Gas Industry cannibalizing itself to stay alive, BHP Billiton has been unsuccessful in its shale oil business. The volatility in iron ore prices in 2017 has continued into 2018. The Australian government’s statistics office has forecast the price of iron ore to drop 20 percent this year. Additionally, coal demand is contingent to downward pressure as China transits to clean-energy consumption and overcapacity correction. However, BHP stock is likely to benefit from cheaper Australian dollar and greater demand as the global economy recovers. Although China is relying less on foreign supply, India, Malaysia and Vietnam are likely to pick up the slack. Escondida copper mine’s first expansion production has been realised in December 2017. With fewer large deposits being discovered and growing limited water resource, copper is a “metal of the future” increasingly needed by electric vehicles. PMI is expanding at a pace not seen in years in the U.S., eurozone and China, which is an indicator of higher copper price. Following China’s import ban of scrap metal, expectations are optimistic that China would import more refined metal and products. ASX BHP shares current P/E ratio TTM stands at 22.68, while industry indicator stands at 28.5. Comparatively, Rio Tinto’s current P/E ratio is 13.44, and South 32 has a P/E ratio of 12.14. BHP is more expensive, and investors are paying more than they should for each dollar of BHP’s earnings. However, BHP Billiton stock earnings are more diverse so BHP may trade at a premium due to a higher quality cash flow. ASX BHP shares have a basic EPS of 2.21 AUD while Rio Tinto’s basic EPS is much higher at 6.17 AUD. Coupled with it, BHP Billiton stock EPS has declined by 17.53% in the past 5 years. It should be noted though that industry EPS has declined 20.43% and the previous years have witnessed a bleak commodity market. At the current stage, BHP stock profit margin is smaller than Rio Tinto’s by 5.86%. That could be attributed to geological problems and failed investment into American shale oil industry. 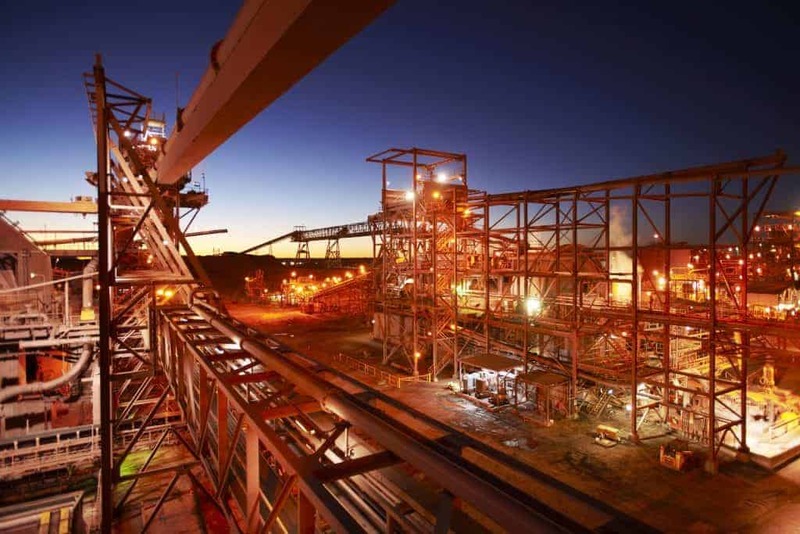 BHP stock free cash flow reached US$12.6 billion in FY2017 and was the second highest on record, supported by productivity gains and capital discipline. 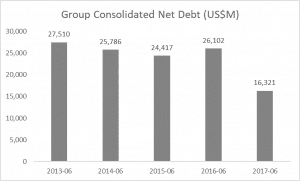 Following a sharp decline in FY2016, FY2017 was a strong year of financial growth and net debt was down by US$9.8 billion. BHP Billiton shares reported a 25 percent rise in underlying half-year profit on February 20, 2018. Revenue rose 16 percent during the half year to $21.78 billion, with copper revenues jumping nearly 52 percent. The miner declared an interim dividend of $0.55 per share, up nearly 38 percent from last year. 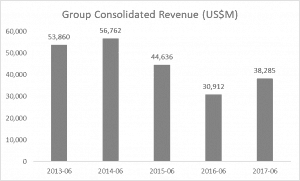 With a strong FY 2017, BHP Billiton shares have to start to rebound against geological complication, shale oil failure and a bleak commodity market. In the context of clean energy transformation, Australia is still strong in its export with rich thermal coal, petroleum and depreciating Australian dollar. Holding in its portfolio many copper mines, BHP is likely to benefit from the ongoing demand of global copper. Electric vehicles, water shortage and shrinking high-qualified supply are to support high copper price. The roller coaster ride on the financial market can be nerve-wracking though. With a more volatile global market and economy, BHP is also subject to the exchange rate, interest rate, geopolitical and other fluctuations.